Japan’s Mao Asada performs to Gershwin’s “I Got Rhythm” at the 2012-13 ISU Grand Prix Final of Figure Skating. In the first event of the Senior part of the 2012-13 ISU Grand Prix Final of Figure Skating, Japan’s Mao Asada edged out USA’s Ashley Wagner for the lead, while teammate Akiko Suzuki finished third. Skating last, Asada was upbeat and entertaining in her routine set to I’ve Got Rhythm by George Gershwin. She landed a floating double Axel and a triple flip-double loop combination, and picked up a level four for all her non-jumping elements. Despite her technical proficiency and excellent skating skills, the Olympic silver medalist’s program appeared to be almost superficial for a skater of her caliber. The student of Nobuo Sato was relaxed and carefree throughout, and was obviously enjoying her performance. However, the program did not require her to demonstrate her ability to interact with her music on a more profound level to the extent to which some of her most memorable routines have in the past. She scored 66.96 (35.02/31.94) points, picking up the highest sums for both the technique and program components. Wagner, who was the front-runner after winning two events with impressive scores, had to settle for a runner-up position in Sochi. She was also flawless, and earned a level four for all her spins and steps, but a slight disadvantage in the basic value of the program (28.94 for the American vs. 29.31 for the Japanese), as well as a 0.5 point difference in Asada’s favor in program components scores, put her in second place with a score of 66.44 points (34.95/31.49) points – a new personal best. The contrast between the two skaters could not have been more pronounced. Where Asada was cheerful and easy-going, Wagner, who skated to the famous Red Violin soundtrack, was sinister and sophisticated. The complex choreography of her routine required total commitment and perfect body line, and the student of John Nicks was up to the task. Ironically, Asada and Wagner were the only two skaters among the sixth finalists not to attempt a triple-triple combination. The Four Continents champion does not believe it will be necessary for a victory tomorrow. 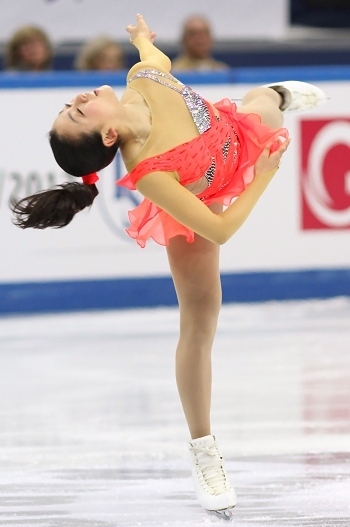 Suzuki, who made major mistakes at her both Grand Prix events, told the press before the start of the competition that her focus will be on skating a clean short. In order to achieve it, the student of Hiroshi Nagakubo replaced her triple Lutz out of steps with a triple flip. It certainly helped. While the 2012 World silver medalist was not entirely clean (she stumbled during her flying camel spin), she landed and fully rotated all her jumps, picking up 65.00 (34.63/30.37) points for her effort. Aggressive was certainly a very appropriate word to describe her performance to the Kill Bill and Once Upon a Time in Mexico soundtracks. The 27-year-old broke away from ‘ice princess’ image female skaters are still expected to adhere to, and showed a lot of fighting spirit in her sharp and brusque moves. The judges, unfortunately, were not quite convinced. Despite the intensity of her performance, she only earned the fourth highest program component score. Finland’s Kiira Korpi, for whom this is the first ISU Grand Prix Final of her career, had to overcome a lot of difficulties just to skate in Sochi. Considering the circumstances her performance to The Girl with Flaxen Hair by Claude Debussy was quite strong. Her only mistake was underrotating the second jump in a triple toe-triple toe combination. She scored 63.42 (32.67/30.75) to become the last skater to score above 60 points. The lone representative of the hosts, Elizaveta Tuktamysheva, was once again unable to deliver a clean short program. The student of Alexei Mishin returned to last season’s program to Dark Eyes, which, according to her, ‘is more comfortable’. However, she still opened up the second jump of her planned triple toe-triple toe in the air. In the end, it became a flawed 3-2 combination. Nevertheless, she managed to pick up 56.61 (29.12/27.49) points. USA’s Christina Gao crashed on her opening triple toe, and later underrotated her triple loop to finish sixth (48.56).